Frigidaire's FFRE1833Q2 18,500 BTU 230V Window-Mounted Median Air Conditioner is perfect for cooling a room up to 1,050 square feet. It quickly cools the room on hot days and quiet operation keeps you cool without keeping you awake. Ready-Select electronic controls allow you to set the comfort level to your preference, while a convenient temperature-readout displays the set temperature. Effortless temperature sensing remote control allows you to see, set and maintain room temperature from across the room. The multi-speed fan features three different speeds for more cooling flexibility and the 8-way comfort control design allows you to easily control the direction of the cool air, wherever the unit is mounted. Plus, the clean air ionizer removes pollen and impurities from the air providing relief for allergy sufferers. This unit requires a special 230V electrical outlet and will not operate with a standard 115V household electrical outlet. Quickly cools a room up to 1,050 sq. 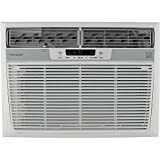 ft.
Frigidaire 18,500 BTU 230V Window-Mounted Median Air Conditioner with Temperature Sensing Remote Control out of 5 based on ratings. Air Conditioner Cover – 19W,14H,4D – Tired of the drafts of cold air!!! from your window mounted airconditioner? This product is finally the answer.